To leave a legacy behind, Nata Ratna Nandamuri Balakrishna paired with National award winning director Krish Jagarlamudi for his landmark 100th Film, “GAUTAMIPUTRA SATAKARNI” under the production company, ‘First Frame Entertainments’. SARIGAMA CINEMA in association with PJ ENTERTAINMENTS proudly announces that we acquired the distribution rights of the Telugu biographical epic, action film, “GAUTAMIPUTRA SATAKARNI” throughout Europe (Non UK). 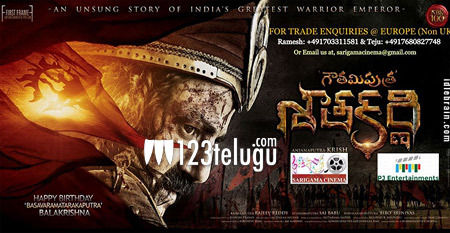 Gautamiputra Satakarni is a film based on life history of 2nd Century Satavahana ruler. The teaser was released on Vijayadasami which looks very promising and interesting with outstanding upscale visuals. Nandamuri Balakrishna looks very intense in the teaser. Not to mention, our Balayya is one of those promising actors who could adapt to any kind of character and play accordingly. Many movie lovers are eagerly waiting to see of how magnificently our Balayya could engross and carry through as Gautamiputra. We sincerely thank Sandy (Nirvana Cinemas), Blue eyes entertainments and Y. Rajeev Reddy (producer), for giving us this opportunity to release Balakrishna’s most awaited 100th Film throughout Europe (Non UK). We take a lot of pride in presenting this movie.